채미정은 고려에서 조선의 왕조 교체기에 두 왕조를 섬기지 않고 금오산 아래 은거한 야은 길재(1353~1419)의 충절과 학문을 추모하기 위해 영조 44년(1768년)에 금오산 아래 건립한 정자이다. 채미정은 멀리 바라보이는 금오산과 채미정 전면의 맑은 계류와 수목들이 채미정과 어우러져 아름다운 조화를 이루는 경관미가 뛰어난 명승지이다. 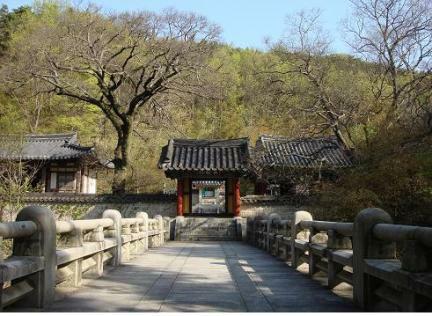 Chaemijeong Pavilion, or Fernbrake Gathering Pavilion was built to commemorate the unwavering loyalty and academic achievements of Gil Jae (1353-1419, pen-name: Yaeun), a distinguished scholar toward the end of the Goryeo Dynasty. The pavilion was built in 1768, the 44th year of the reign of King Yeongjo of the Joseon Dynasty. 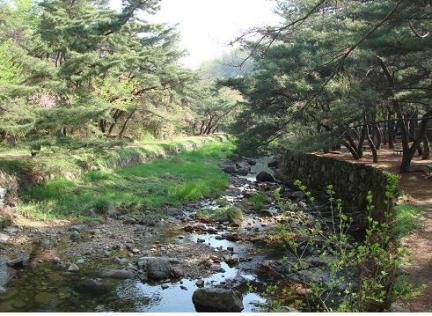 Gil lived in seclusion here at the foot of Geumosan Mountain, refusing to serve two dynasties at the time of Joseon’s foundation. The pavilion stands on a pristine scenic spot alongside a clean stream flowing down a valley with lush foliage, creating a beautiful landscape against the backdrop of Geumosan Mountain.